Before we grabbed all that free candy, Mom would make us eat dinner. I have lots of memories of eating Halloween night dinner with a pillowcase clothes-pinned around my neck to keep my costume from getting dirty. I barely remembered what I was eating because all I could think about was candy, candy, candy! I don’t think we had anything as fun as these jack-o-lantern peppers, though. I saw the idea for this meal somewhere in the depths of the internet, and I thought it was the cutest thing ever. What a great idea, cutting out a jack-o-lantern face from orange bell peppers! These peppers are perfectly kid-friendly, cause they’re stuffed with an awesome filling reminiscent of pepperoni pizza — ground beef, pepperoni slices, black olives, an herby tomato sauce, and gobs of melty mozzarella cheese. 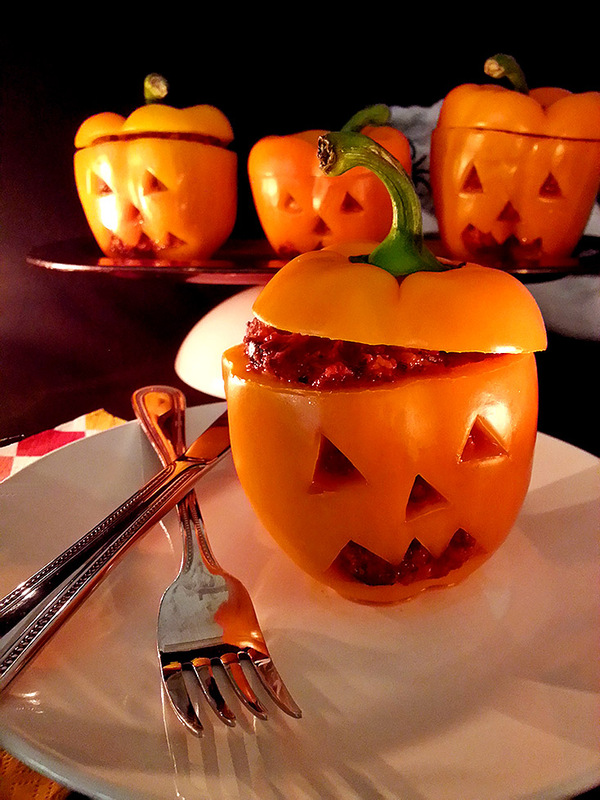 Your kiddos will be perfectly happy to eat these adorable stuffed peppers before trolling the streets for candy! Start by cleaning the bell peppers! Rinse them well and pat them dry, and cut off the tops about 1 to 1 1/2 inch down. Pull out the seeds and the membranes inside and discard them. Using a small paring knife or an X-Acto knife, cut out a jack-o-lantern face from each pepper. Slice a thin bit from the bottoms of each pepper so that they can sit flat without falling over. Eat the little bits that you cut out, cause they’re good! Keep the lids cause you’re gonna need them later. Set the carved peppers aside and grab a big skillet. Over medium-high heat, brown the ground beef with the minced onion and garlic, the herbs, salt and pepper and chopped pepperoni. Stir occasionally, and once the meat is cooked through, stir in the whole can of tomato paste, followed by the drained olives and crushed tomatoes. Turn the heat to medium-low. Cook the meat and tomato mixture until it’s hot and bubbling. Before you’re ready to stuff the peppers, put them on a microwave-safe plate and cook them for 2-3 minutes, just enough to slightly soften them. When you’re ready to stuff the peppers, stir the mozzarella chunks into the stuffing mixture so that they’re evenly combined. Divide the hot filling mixture between your 6 peppers, put their lids on, and boom! A delicious, simple dinner perfect to feed the kids before their trick-or-treating escapades! These would go perfectly with a big green salad and some garlic knots or soft garlic breadsticks. Yum! Give ’em a try, they’re awfully tasty. Previous Previous post: creepy chocolate spiderweb treats!